A friend of mine sails his Folbot Yukon with a Balogh Sail rig. So do I. He has come up with a hand tiller, which I have copied. He has used his extensively. I have yet to test mine on the water. I'm imagining that close-hauled I'll need to turn my head to avoid contact with the boom. Possible refinements to come. A West Marine Shorty telescoping boat hook is relieved of its riveted hook end and a dingy spinnaker pole end substituted. The pole end, 22mm, required just a bit of Gorilla Tape around the neck for a snug fit. The existing boat hook rivet holes do not work with the spinnaker pole end. Instead, the spinnaker pole end is held in place by a stainless set screw. I used a washer with the set screw to reduce the effective length of a screw I had on hand. The spinnaker pole end clips into a threaded eye bolt. The threaded eye has been attached to the rudder yoke crosspiece using three hose clamps. The Folbot rudder yoke crosspiece rotates freely. Should the eye flip to vertical, it might depress the pole end trigger when pushing the tiller abaft, releasing the tiller from the eye. I installed a hose clamp on the eye, fitted somewhat loosely. That solves the problem. A second clamp was installed tightly where the non-welded eye meets the bolt shank. This stopped the pole end from binding there. When not using the hand tiller, it rests in a length of Velcro one wrap connected to form a loop. A brass grommet set into the one wrap to allow it to be anchored between the seat strap screw and its star knob. The loop needs to be large enough to allow the hand tiller to slide fore and aft when using the rudder foot control. I'm really curious as well as to which BSD rig you guys are sailing? I think you've got a really cool design there. I do have a concern though, and that would be the hose clamps. I tend to crawl back up onto my sailing swamped boat from the stern. Because of that I try and keep it as free and clear of sharp edges as I can (dealing with the rudder mechanics is bad enough). I remember using a hose clamp for something on my boat once, for sailing, but I can't remember for what. The point is that before I even got to the water I had scraped or scratched or cut something on that clamp to the point where I removed it and found another binding solution... In other words be careful with those edges. You might be able to cut a section of hose that sliced down it's length could be placed over all those hose clamps and eliminate all those edges. I don't know and I can't really see here how the Folbot yoke is designed but it looks like it's a round shaft. If so you might be able to take a large dowel, like a one foot section of broom handle, and drill into it from the end so that the yoke spline fits into the hole snuggly, i.e. the broom handle would slide over the rudder yoke. That would make a nice wooden extension for your tiller to connect too. A longer registration pin could hold it all in place where the existing rudder peddle cable pin is, the length of the drilled hole keeps it aligned to the yoke... clean and easy to take on and off. Perhaps a pain to make though if you don't have access to a drill press. Actually sounds too easy... there must be other issues here. I have a lot of slop in my tiller and I think yours is going to be pretty nice and tight. I'm envious and looking forward to hearing how it works. A tiller handle is an absolute necessity for sailing above the cockpit. Tell us more about the sail and using the cross-cockpit seat. This tiller setup is new to me. I have not had it on the water. The friend who designed it has been using it successfully for years. He uses acas and amas and I believe a 32 square foot sail. I own 24, 32, and 38 square foot Balogh sails. I have never sailed without acas and amas. I would like to try! The hose clamps concern me, too. At minimum I plan to trim the tails or find smaller clamps. I already pack the rudder with the frame to prevent skin damage. While I have never swamped, I'm not sure I would attempt re-entry from the stern. The Folbot rudder pintle sticks up quite far and the ridge tube might not support my weight. The dowel idea sounds good but I haven't a drill press. There is also the shackle at the yoke end that might interfere with a dowel. The seat seems to want a sweet spot in order to clamp securely to the coaming. I would rather have the freedom to adjust seat location. I may look to modifying the seat or make one. I have a Klepper hike-out seat that came with my Aerius I, but I'm not even sure how to install it on the Klepper! I don't know what lee board set up you use, but if you don't have one you'd be amazed at the difference in stability it makes. In my last year in Naples I never used the amas on my Hobie Adventure Island and it was just fine with a 28“ beam and a square topped 57 sq ft sail, often in less than ideal conditions. The massive weight of that kayak helped I think, but the minimal dagger board really slowed down the roll and the square topped sail spilled the gusts nicely, although I did have to fit a boom for better sail control. Also, I think the bigger the sail, the more important a slack free tiller is to be able to finely balance the sail on a reach. I use the standard Balogh leeboard, mounted on the port side. See attached pic of my sail rig on a Folbot Aleut. I often wonder if an additional leeboard mounted on the starboard side would be helpful. I think adding another leeboard would be overkill. The BSD boards are big and do their intended job just fine. I think adding a second would complicate more operations than you would gain in sail stability. On your boat one already looks like overkill. Your Yukon appears a lot shorter than I would have thought... I think you could sail it without the aka/ama combo but you really need to be able to get up on the sides of the coaming. You want to be able to counter the lean of the sail and the sad fact is that the cross boards; Klepper and I'm guessing the Folbot as well, only lift you up in the center... which you don't really need. The best solution I have found are the Hike out seats from Long Haul. They give you a nice cushion to sit on outside of the coaming and more importantly pad that edge so you can actually sit on and beyond it. These seats, and reefing your sail to begin with, will open a new world of sailing for you. I recommend an electric pump as well. Ha. But definitely have a canvas bucket and sponge on board at the very least... and tie everything to the boat. You should be able to connect and disconnect the BSD akas while out on the water but I found it pretty difficult. Unless you are in the water. When you climb up on the stern you don't have to come up over the rudder assembly, it's actually easier not too. Just boost yourself up onto the stern perpendicular to it and then swing a leg over and start working your way back up to the cockpit. Easy-peasy. Try the bench. I've tried the Klepper sailing deck and my own version and neither worked too well. The Klepper was better but it's slippery. Put something on it so you don't slide off. 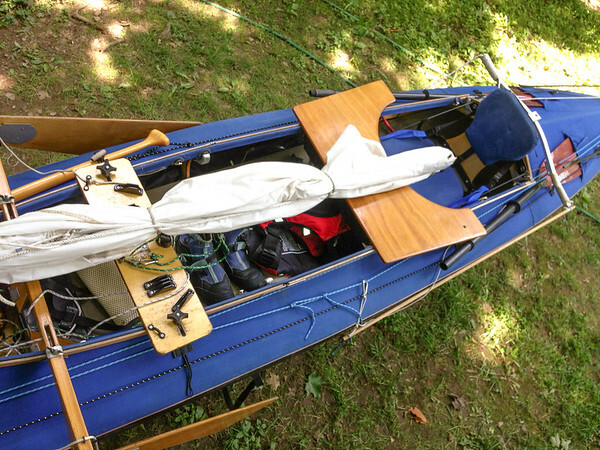 The Klepper board has straps that simply strap down around the ribs by the keel of the boat. Throw some foam padding down in the bottom of the boat so you can scrabble around on your knees without pain. I would definitely try and put a section of garden hose or similar over the hose clamps. Simon is absolutely correct in that a tight connection makes for better control. I have hand tillers for both of my boats which connect to the boomerang at the back of the cockpit. The MK1 sails with the hand tiller alone and the rudder peddles. On my AEII I usually connect a short extension (like a 48 inch dowel) to the hand tiller with line. It's sloppy but it works. I'd like a nice long rod going all the way back to the yoke similar to what you have done but I'm also struggling with the mounting to the yoke. I posted this because it shows an attempt at a long extension tiller on the port side. I took two stringers from an old AEII and jammed them together then tied one end back on the yoke. It actually worked pretty good until the water loosened my 'jam' fit of the two stringers and they disconnected. The hand tiller alone is plenty though. I tried this 'long' option before I got the hand tiller for this boat. Here's a shot of how the short extension connects to the hand tiller. Not optimum, there's a lot of slack, but it works. It's not like we're getting these tubs up on a plane or anything... so a little slop isn't so bad... I have an anchor trolley which I can connect the forward end of the extension too. This makes for a kind of steering cruise control. Very handy in a steady wind. Thanks Dennis for the great shots and tips. It is very cool seeing your progress and innovation, looks like you are ready for just about any condition. That said, this old man with his creaky knees will never be able to use a hiking seat, and I really don't like risking capsize just because I am too lazy and scared at the prospect of righting/reentry/bailing. This limits my sailing to the Kayaksailor, but I am fine with that! RangerTim: Just curious how your hand tiller works in rough conditions. Seems to me that, depending on the bite of your rudder, the lack of mechanical advantage you would otherwise get from a boomerang-mounted tiller setup would make your tiller hard to manage...but maybe not. The only experience I have is with a Hobie Cat, and that tiller setup has plenty of mechanical advantage (distance between tiller attachment point on yoke and the yoke pivot point). Can you share your experience? Just like anything Greg, it's about being in the right place and time for testing out something new. Climbing back into the boat on a flat lake, little breeze, warm water... it's like playing. Low stress and no rush... while you relive the exhilaration you felt just before you went over. If you've ever swum or snorkeled from the boat getting back in is just as easy. As a matter of fact, if you had a BSD rig you could simply slide an aka/ama in on one side and hang a rope ladder step to get back in... I think this might work. I think you'd enjoy the larger sail and you can always use the outriggers for the more adventurous voyages. That's what I'll probably do. Still haven't figured out a way to elevate those akas... but I may have an idea... more to come. When did you sell your AEII and sail rig? I noticed that a couple weeks ago. Thanks Dennis. I have turtled a Hobie Cat several times, fairly easy to right and there is nothing to bail and "reentry" is no problem. But that is the extent of my capsize experience...so far. Sold the Klepper A2 last fall, it was just getting no use. I am hooked on the Kayaksailor, especially when I plan a day of sailing and paddling, and the Quattro gets most of the time I have on the water. Capsizing is not something I usually consider with the stable Folbot models I own. Even with acas and amas I guess it's possible, especially if an aca snaps. David Valverde, Balogh owner, recently reinforced my crosstube to reduce the possibility of a failure at the aca-crosstube joint. While in any of my Folbots on relatively flat water I can strike the acas and all but the lower mast section, stowing all on board. I leave the sail on the lower mast section and rotate it on to the foredeck. I bungee it as is or pull on the sail bag before rotating. 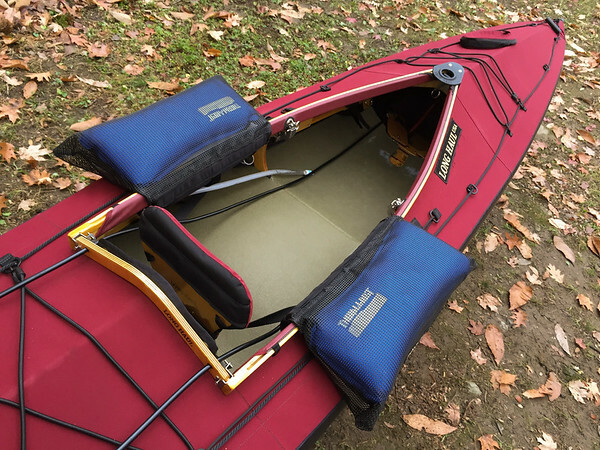 With the 12' Aleut and 13' Yukon paddling can be awkward, but for landing and launching at openings less than 12' wide this is handy. I would never try it in my hardshell, which is also Balogh-equipped. A vent-shaft single-blade paddle, like a ZRE, makes paddling easier as it reduces the interference from the crosstube. The hike out seats look great. I'll give them some thought. As I mentioned, I have not yet field tested the hand tiller. Within a week I expect to be on Georgian Bay. I'll give it a try there. Tim that's a fantastic idea about putting the sail in the bag and simply rotating it forward. I hadn't thought about that, definitely on my 'to try' list. Greg, don't you think it would be nice to be able to just drop the KS sail into the mast partner and have it ready to go? Maybe used in conjunction with the Klepper lee boards? (Did you sell those too?) Anyway, just a thought and something that I keep thinking about because I love that little sail as well. Greg I'd actually like to lose the mast car altogether and have a very simple drop in mast system. I'd like to maintain the reefing option and the jib... but I think the rigging of the jib might be too complicated to keep in a simple rigging scenario. Envision something with the simplicity of the Flat Earth sails, except with the Kayaksailor batwing. Some sort of arrangement where the folded sail could be kept in a paddle pocket(?) on the deck or under the front deck, maybe in a sleeve. Pull it out of the sleeve and drop it into the mast hole. clip the stays in and sail reefed or expand it to full size... I'm thinking cleats for the main and halyard could be on a little triangle that rides at the front of the cockpit. Leeboard? I don't know. The Flat Earth guys are using their Greenland paddles. It's a great system as is... on the double it's out of the way as well so probably not so imperative there. I guess I'm thinking more about efficiency of use and space on the singles. But if it's possible to do, it could be very nice for the double as well. Kinda dreaming here, I don't think I can bring myself to take my KS apart. 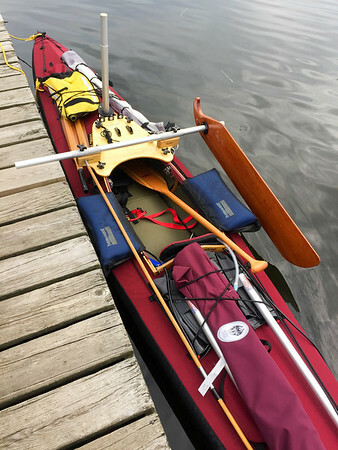 I would just love to have a great little sail that can be dropped into that mast partner and be sailing... the Kayaksailor is a great size and shape for this, and it's so forgiving a sail that you don't really need to worry about outriggers and all that gear. I guess the real incentive here is that after striking the sail and putting it back into it's sleeve you're back to a paddling boat with no obstructions on the front of the cockpit.